This week my blog post is inspired by two case reports I read of physiotherapists completing their Diploma in Canine Rehabilitation (our Canadian certification, through the Animal Rehab Division of the Canadian Physiotherapy Association), and a newsletter from another Canadian Physiotherapist whose information to which I subscribe (www.APTEI.ca). So, lets’ start with the APTEI Report (Advanced Physical Therapy Education Institute). The first page of the Winter Newsletter is entitled, Physiotherapists are Movement Specialists. The article gives a short review of the history of physical therapy, and how exercise was the original rooting of our profession. Physical therapy was created as a result of the first World War from the need to get wounded soldiers moving and functioning again. Traditional medicine and nursing weren’t addressing these needs. Hence the creation of “Remedial Gymnasts”, practitioners that specialized in moving patients and prescribing exercises. This practitioner group eventually evolved into physical therapists. 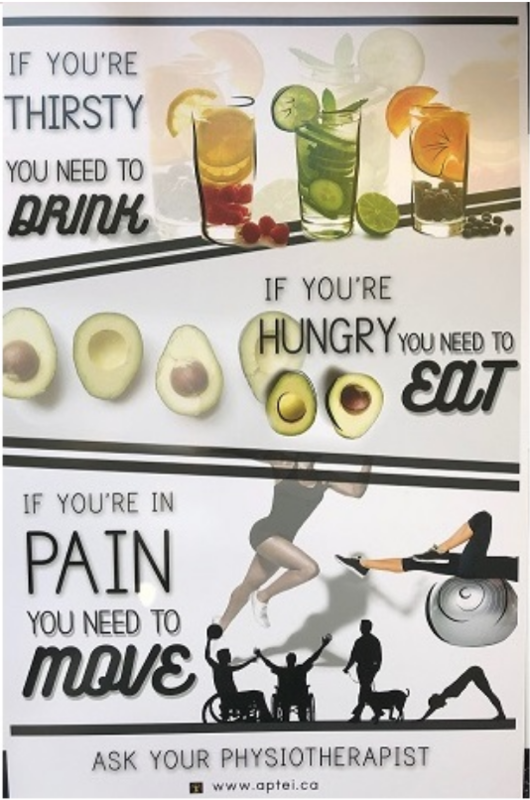 The CEO of APTEI even created a poster to highlight the importance of movement, which as a member of his website / subscriber to his newsletter, I even received in the mail last week!! (And I’m getting it laminated to put up in my clinic!) It’s simple! It makes sense! It’s important! Next in my brain that highlights the need to move & exercises, are the two case reports that I graded. Both from therapists that do house calls, or rather from what I know, aren’t in big rehab facilities. In addition to their laser and manual therapy, much of their therapy and therapeutic advisement consisted of exercise. Thoughtful, progressive prescription of exercises. And you know what? It worked! One case was a dog that had been lame after cruciate reconstruction for over 8 months! The other case was an acute iliopsoas strain that went back to agility. Both cases highlighted exercises as a key component to their rehabilitation. But what’s most important to note is that the exercises were specific. They were targeted. They progressed as the dog improved. So, as simple as it might SEEM, or as common sense as it might APPEAR. The advice we can give as rehab professionals in regards to exercises (based on our knowledge of pathology, anatomy, tissue healing, and tissue response) is important, impactful, and second to none! So, whatever you do this week… be sure to prescribe some exercises!